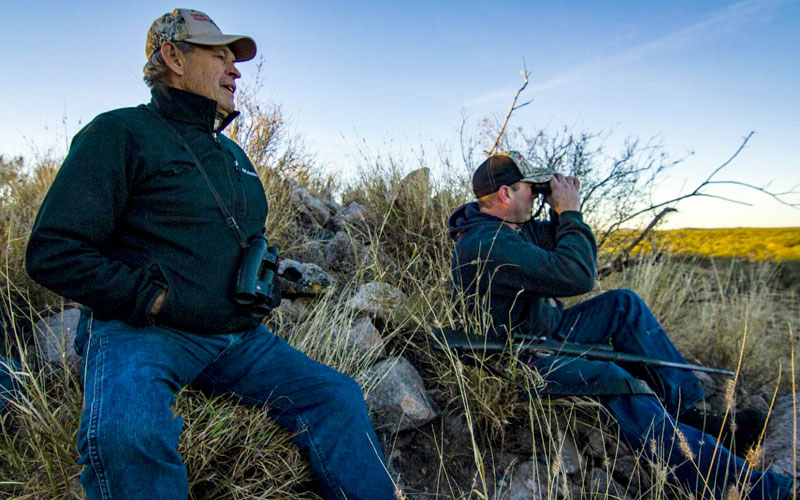 RANCHO GRANDE, Mexico – It’s just after sunrise, and hunting guide Jim Schaafsma is trudging through the brush up a small rise about 60 miles north of Hermosillo. He pauses just shy of the top. He was hoping to give his client Brandon Barnwell a good vantage on the trophy mule deer he had spent thousands of dollars and traveled hundreds of miles for. After a silent half hour waiting for the right-size buck to pass through the draw below the rise, Schaafsma shared his frustration with Barnwell, a fellow Californian. “They weren’t happy about something,” Barnwell replied. He and Schaafsma were scouring a piece of 48,000-acre Rancho Grande, a major cattle operation that doubles as a hunting preserve. Stretching over rolling hills tangled with mesquite, ironwood and paloverde, it still raises beef, but as a designated conservation-management area, the ranch also supports sizable herds of healthy mule deer. With high-protein feed and breeding programs, some of the deer are managed in ways akin to the cows they share the ranch with. Rancho Grande also raises desert bighorn sheep, which are highly prized by hunters. Such arrangements have benefited Sonoran ranchers and game populations, which were seriously compromised before the public-private management areas were established. Barnwell could pay up to $15,000 for a successful deer hunt. A desert bighorn sheep hunt can command several times that price, sometimes as high as $100,000. Sonoran officials estimate up to $30 million in economic impact this season: hotel stays, outfitter fees, food, hunting tags, tips to guides and other costs for organizing hunts. However, the state agency that oversees the hunts, known by the acronym SAGARHPA, sees comparatively little of that money. According to information provided to KJZZ in response to a public-records request, it has taken in about $140,000 in tag sales so far this year. Currently, all hunting tags, regardless of species, cost roughly $16 each, according to records and officials. Requiring licenses for foreign hunters – as they are for Mexican nationals – as well as higher tag fees for certain species to increase revenue, have been discussed, but those changes would require federal legislation, an official said. Hunting also is a lifeline for ranchers. Jesus Fimbres, whose family owns Rancho Grande, says having two revenue streams to depend on has been a big part of their success. Fimbres’ ranch is what is known as a conservation management unit, known as a UMA. Getting that status, which allows his family to run hunts on the property, requires developing a management plan for the sustainable use of wildlife. There are now more than 1,600 of them in Sonora, adding up to more than 18 million acres. In Schaafsma’s nearly 30 years guiding hunts in Sonora with his company Arrow Five Outfitters in Zenia, California, he has seen that change in mindset. The desert bighorn sheep population also has seen improvement, said Raul Valdez, professor emeritus at New Mexico State University’s department of fish, wildlife and conservation ecology. He has studied wild sheep all around the world, including Mexico. Hunters, on the other hand, “Are willing to live in a tent in the most extreme conditions, and pay thousands and thousands of dollars for the opportunity to do so,” he said. Cesar Alonso de Leon Nuñez, head of wildlife at SAGARHPA, said UMAs that raise bighorn sheep are obligated to help repopulate the species’ historic habitat. Fimbres told KJZZ that his ranch released dozens of sheep to free-range areas of the property last year. Back at Rancho Grande, Barnwell’s patience has eventually paid off. “I’ve already texted them, and I told them to start saving their money so they can come down,” he said with a laugh.